One sign that it's spring in the U.S. is that the nation is turning its attention to basketball. In particular, the NCAA tournament starts this week for both men’s and women’s college teams. The men’s tourney, the second-most popular sports event after the Super Bowl, recently jumped from 64 to 68 qualifying teams. Every year, a big controversy surrounds whether or not your favorite team is selected and then how high (or low) your favorite is ranked in the pairings. The teams are paired against each other in brackets, which are printed out and shared among friends and family members. In the workplace, co-workers often bet money on the outcomes in office pools. Looking at the bracketed pairings above, you can see that the left and right margins are filled with specific team names, with the winners of each bracket advancing towards the championship slots in the middle of the chart. The March Madness tournament seems “mad” because of the wild beginning to the competition. After a preliminary play-in round with the lowest 8 teams, the first full round begins with 32 games in two days. With lots of TV coverage and highlight reports, this is a basketball lover’s dream. After the first Thursday/Friday round, 32 teams are eliminated. After the second round (Saturday/Sunday), 16 more teams are eliminated. The goal is to finish the first weekend of play by advancing to the Sweet Sixteen. The second weekend eliminates eight teams in the third round and four more teams in the fourth round, taking the winners from the Elite Eight to the Final Four. Reaching the hallowed ground of the Final Four gives prestige and national attention to those four universities. My team, the University of Michigan, received a #2 seed and will play #15 Montana on Thursday. 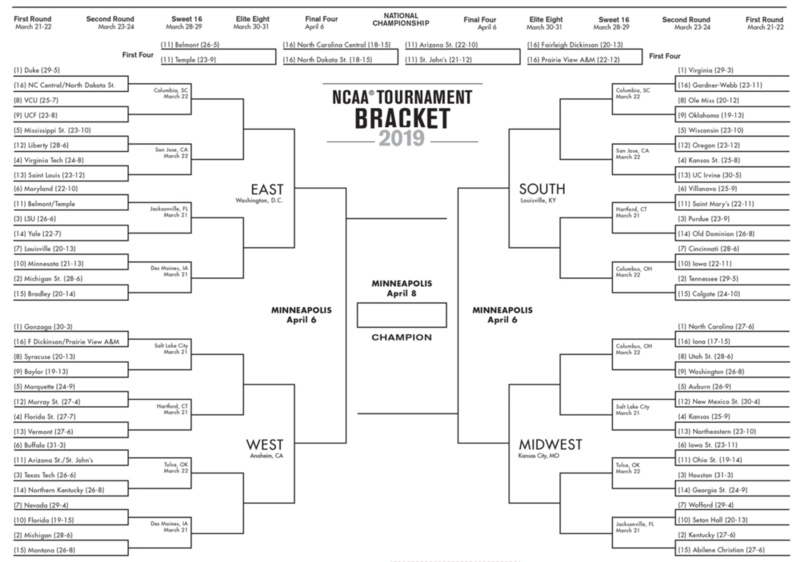 Culture tip: During this three-week period, it’s customary to ask your sports-minded friends and co-workers, “How are your brackets doing?” Lower-seeded teams that upset higher-ranked teams are called Bracket Busters. Happy madness, everyone! ranked pairings = The top 64 teams are separated into four regional competitions (with 16 teams in each region). The #1 ranked (or seeded) team plays the lowest team, #16 while the #2 team plays the #15 team, and so on. Thanksgiving in the U.S. is celebrated on the fourth Thursday of November. It commemorates the first successful harvest of the early European settlers in Massachusetts and was an opportunity for them to give thanks for good weather, cooperation with local Native Americans, and enough food to survive the oncoming winter. Schools and businesses are closed for the day. Because the holiday is on Thursday, it gives most Americans a four-day weekend, so many people use this opportunity to travel back to their hometowns to celebrate with relatives. Nationally, it is the busiest travel week for airlines. College students go home to be with family. Homeless shelters serve turkey and other traditional food. In addition to eating and visiting, Americans watch morning parades and afternoon football games on TV. The most traditional meat served that day is turkey (although some eat ham). Americans typically eat too much that day, and tables are full to overflowing with special casseroles, potatoes, yams, cranberry sauce, gravy, rolls or corn bread. The most common dessert is pumpkin pie, but apple and mincemeat pies are also common. The day after Thanksgiving marks the first day of the business year that retailers operate in the black, that is, begin to see profits. For this reason, merchants have come to call this day Black Friday. It is the busiest shopping day of the year, as early birds line up in pre-dawn hours to take advantage of limited-time sales. Black Friday is the first official shopping day for those getting ready for Christmastime giving.